As you may know, I have been on the lookout for tyres since the stock items started developing hairline cracks along their treads. The original plan was to push them till at least 40,000 kms before getting them replaced but little did I know that life already had other plans for me. I inadvertently jumped a kerb while turning into the basement of my building, which immediately chipped the two right hand-side alloys and blew a hole in the right rear tyre. As if that wasn’t bad enough, I had just had the rims painted gunmetal grey a week prior to my incident. Enter ZDegree, which has now become my ‘go to’ for anything tyre related. I ordered the tyres online and the following morning they sent over their mobile tyre fitting van. Out went the Dunlops, replaced by fresh new Pirelli P Zeros. The guys did a wonderful job and took just 45 minutes, after which the wheels were balanced, the new tyres filled with nitrogen (a 50% price discount can be had on the alignment if you go to one of their workshops for the work to be done) and Juliet was wearing brand new shoes. I had heard good things about the P Zeros and, so far at least, impressions are good. There’s far less road noise than before and they seem to be slightly more pliant over speed bumps. Let’s hope that these last me longer than the Dunlops – I will update in the next issue about how they behave on a mountain run. Post servicing, the gearbox no longer suffers from its stuttering and lunging, which is odd because I checked with the service centre and they claim not to have carried out any gearbox reset. I guess this is typical Alfa behaviour with the car throwing tantrums. For now, I am waiting for some parts to be delivered from the UK: LED headlights, door entry logo projection lights and some carbonfibre badges. A visit to the Alfa specialists is already planned – more on that next time. 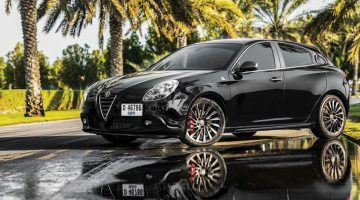 ENJOY OUR ALFA ROMEO GIULIETTA LONG TERM REVIEW?